For Headliner Highlight 004 we talk with Andy Wang. He is the host of the weekly Inspired Money podcast, a show that puts money & inspiration together. What is Inspired Money about? At Inspired Money we put it this way, from making it to giving it away – Inspired Money means making a difference, creating something bigger than oneself and making the world a better place. It’s about helping listeners to improve their money mindset by hearing the stories of successful entrepreneurs, nonprofit leaders and even a former WWE wrestler to help you get inspired, shift your perspectives on money and achieve incredible things. 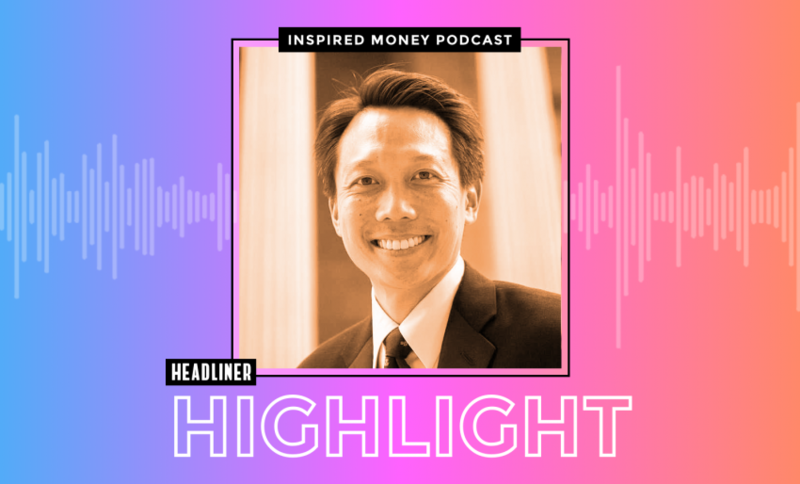 Inspired Money launched September of 2017, and we’re currently at over 80 episodes. For me, it’s about my desire to learn something while driving to work or while washing the dishes. In my day job, I’m a financial advisor. So I work with people and their money. Money conversations don’t happen nearly enough and when they do they’re often not fun or shared. I started podcasting because I wanted to find interesting money stories because there are people out there doing really cool things with or because of money. Those positive stories are fun. They’re interesting and we can learn from them. I want my show to inspire people to look at their own finances and to want to make a bigger impact in their communities and the world. For promotion, our show notes get emailed to our blog subscribers. Besides posting to social media accounts, I’ll share it to the FinCon Podcast Network. That’s a group of financial content creators. And I usually get a retweet from Libsyn my media host. I’m challenging myself to figure out how I can do things that are different and unique. For example, I tested writing an article on Medium. When I interviewed a really cool guest I wrote an article entitled, “Five Success Secrets Revealed by award-winning Ready Player One screenwriter Zack Penn” and I think there’s something there because you can independently grow a following at Medium and that article got over 500 reads. I’m a little obsessed with audiogram creation. I’ve tested different services to create them. I’ve tested different formats. I’ve made them with captions without captions. I’ve tried to tell a story with audiograms treating it almost like a 60-second movie trailer for a podcast episode. It comes down to time. So I need to create them quickly, but do them well. Recently, I have settled in this format: I use a podcast branded image of my guest with large captions. I haven’t been using a waveform, but I’ll experiment with that. It’s difficult to measure the impact that creating and sharing an audiogram has on downloads. On the other hand, when you create a good audiogram, it can significantly increase the chances of your guests or other sharing it. And it can also reflect well on your podcast and brand. Not everyone creates audiograms. So I find that it’s an opportunity to make a good impression with your guests at the time of publishing. My podcasting setup, most of my hardware comes from my hobby as a musician. I play acoustic guitar, mostly Hawaiian music. I have a rig at home that includes a condenser microphone, apogee duet interface and I use Reaper as my doh. At work, I have a vintage CAD equitek E100 mic, QSC touchmix mixer, that lets me record directly to a hard drive and connect Skype for interviews. With a mix minus setup, I can record me and a guest to separate tracks and it works really well. I also have a mobile rig that I’ve use a conferences that includes an iPad, Art USB dual pre and a couple of dynamic Sennheiser e935 microphones. Podcasting is fantastic for its low barriers to entry anyone can do it. But I think the difficulty of creating a great show and producing it consistently is underrated. I encourage people to do it and embrace the process before I started, a friend told me that you have to commit to publishing your show regularly, and that doesn’t mean doing it for a handful of episodes, but doing it for a year without looking at downloads or listeners and that’s great advice. I believe making that commitment upfront really increases the chances for success. Picking a favorite episode is like asking me to pick my favorite kid! Right now, the most downloaded episode is “How to sell and earn more like a Million Dollar Listing New York star” and that’s with Ryan Serhant. it performs really well because people know him from the popular Bravo TV show and he provides a lot of insight and advice to anyone in sales. Actually Ryan says that we are all salespeople and I agree 100%. You might not be a salesperson in your job. But if you’re a podcaster, you are trying to sell your podcast to potential listeners. It was great talking to Ryan who showed a ton of valuable takeaways. One of my favorite episodes is number 17 with professional endurance athlete Colin O’Brady. His story is incredibly inspiring in the episode, despite being an interview, has a story arc. I’m really proud of that. Also. Colin has since set two more world records including becoming the first person in history to cross Antarctica solo, unsupported and unaided. His story has been covered by the New York Times, National Geographic and The Joe Rogan Experience. I proudly say that you can hear Colin story first at Inspired Money.